A unique opportunity to work with one of the dance worlds finest practitioners of Release and Anatomical Image work in one of the most beautiful parts of Scotland. The Studio On The Green is a custom built professional dance studio on the edge of the market town of Selkirk. There are hills to walk on just a few minutes away and a camp site beside the river. There are also many small hotels and inexpensive B & B's nearby. Selkirk is a one hour drive from Edinburgh and one and a half hours from Carlisle. Selkirk has a deli and a range of small shops and restaurants. The focus of this workshop will be on the moving body. Anatomy will be given a context in which it can be experienced and immediately applied. Experiencing anatomy through our senses leads to in-depth and personal understanding of our patterns of use. Understanding use helps us release unnecessary tensions to access deeper supporting structures of the body-mind and expand range of movement and thought. Through imagery-guided movement explorations, and improvisational scores, we can integrate this knowledge into creative physical practice and daily use. We can develop a personal movement language that is clear and articulate, efficient and effective. The aim is to push the edges of limitation and ability, and to affirm movement in all its forms. Practices, teaches and advocates explorative methods of dance making. She performs solo and collaborative work internationally, many of her collaborations involving links across the arts. Her performance work and her teaching are informed by dance improvisation and mindful body practices (including T'ai Chi Ch'uan and Qi Gong, the Alexander Technique (certified teacher), Ideokinesis, and Yoga). 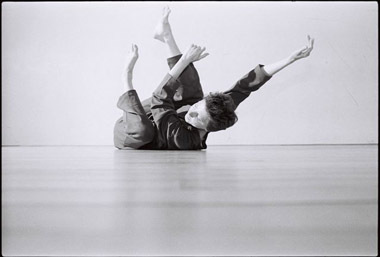 Since 1972, she has been a member of leading groups in the field of experimental dance, including the Trisha Brown Dance Company (1979-86). She has taught dance at major colleges throughout the USA, Australia, and Europe, including on the faculty of the European Dance Development Center, (EDDC) Arnhem, The Netherlands (1990-2002). She has a Master of Fine Arts degree (Dance Research Fellow) from Bennington College, VT, USA (2004). Through both her performing and teaching she aims to communicate her love of full-bodied dancing and her interest in the practice of being in the moment.